As the helicopter followed the river up Langtang valley in the Himalayas, I glimpsed the massive swath of broken stone running down off the cliff to the left and cutting horizontally across the valley. I’d looked at many pictures of Langtang, but this was my first time seeing the former village in person. We landed next to the newly constructed guesthouse where we would be staying, and I had the chance to take in more of the valley. It was not my first time visiting the Himalayas, but it seemed like the most beautiful place I had ever been in my life. The first major earthquake that struck Nepal on 25 April 2015, destroyed Langtang. The quake unleashed an avalanche about 1,000 feet above the village that swept down the cliff, burying the village beneath 20 metres of stone, dirt, and snow. Buildings as tall as three stories were buried without a trace, along with more than 200 villagers and tourists. The descent of the avalanche created a blast of wind estimated at half the force of the atomic bomb dropped on Hiroshima, flattening houses, uprooting trees, prostrating steel electrical poles, and sending people flying hundreds of feet through the air. The disaster was exacerbated by the fact that the day before the earthquake, hundreds of villagers had gathered from all over the valley for a Buddhist ceremony. Overall, more than 300 people died in Langtang—some buried in the avalanche and others in houses collapsed by the force of the blast of wind that followed. As I met with the committee in Kathmandu, I had the chance to begin designing an earthquake-resistant house model that could be used by the people of Langtang as they rebuilt their homes. The government of Nepal had been researching earthquake resistant construction technologies since the earthquake occurred and had published several designs to guide the people of Nepal as they rebuilt. With the help of the committee members and other organisational partners that were already working with the Langtang community, I created a revised version of these plans that would fit Lantang’s needs and culture. By March, we were able to secure permission from the local government to construct six model houses in the valley that would test the design concept and provide a visible model to the community as they rebuilt their homes. 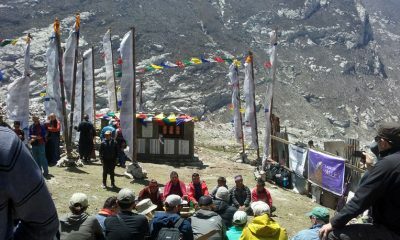 A group discusses plans for Langtang. For the one-year anniversary of the earthquake, there were ceremonies held throughout the country. I was privileged to be present for the ceremony in Langtang. In addition to the villagers who gathered from across the valley, nearly 50 foreigners from various nations had trekked up the valley to attend the ceremony. I was interested to hear what connection the foreigners had to the valley and asked a man from the U.S. why he had come. He informed me that his daughter had been in Langtang the year before and had died in the avalanche. As the ceremony commenced, it became clear that almost everyone who had come was connected to people who had died in the earthquake. One by one, people stood up and tearfully commemorated parents, brothers, sisters, sons, daughters, and loved ones. As more and more people spoke, I gradually began to grasp the magnitude of what had happened here and how many lives had been affected. Recently, our host from the guesthouse where our team is staying showed us where three bodies had been found during the rescue attempts last year. They still remained unclaimed, most likely because they were foreigners. 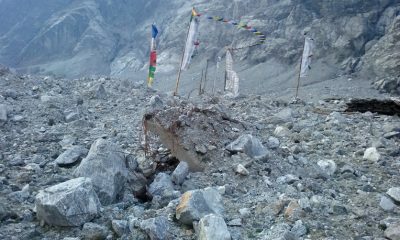 Scattered across the landslide are Tibetan prayer flags marking the places where bodies have been discovered. There are only about 20 of them though; most of those who died remain buried beneath the rocks. Nestled in an overhang beneath the cliff face, one guesthouse remains nearly intact, with only one corner destroyed. It’s the only building remaining from the old village, and it stands alone, overlooking the vast field of stone. The first model house is nearly completed, and the second one is nearly halfway built. Our Samaritan’s Purse office hopes to bring in a sawmill to help utilise the thousands of the trees that were blasted flat by the wind from the avalanche. The saw should help turn these trees into usable wood that can be used for reconstructing houses. Almost every day, foreigners trek past the guesthouse and ask if there is any way that they can help the people of the valley, offering money, skills, or their hands to help reconstruct. Mule trains pass by constantly, bringing cement and other construction supplies, while helicopters fly overhead throughout the day, trailing bundles of reinforcing bar, steel tubing, rubber pipe, and window glass for the hotels and houses. The people of Langtang are rebuilding, and they hope to complete as much construction as possible before the monsoon season arrives. 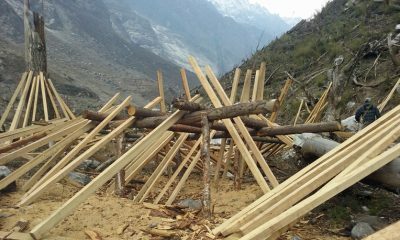 Samaritan’s Purse hopes to use all the trees uprooted by the earthquake for lumber for rebuilding. In all the centuries the Langtang village lay here beneath a towering cliff topped with loose rock, nothing like this landslide had ever occurred. As I write this, I’m sitting in the middle of the stone field left by the landslide. Looking out over this moonscape, I’m struck by how beautiful it looks in the setting sun. All the people that trek through this valley will pass this huge swath of barren rock. With the sun setting over the mountains to my right and the wind sweeping past me up the valley, the whole place seems unnaturally quiet, and the presence of death still seems to hang in the air. The stillness is periodically broken by the sound of helicopters roaring overhead or the passage of a mule train in the distance. The trekkers I have talked to, who had seen Langtang before the earthquake, described it as being like heaven. The Creator of this valley, this sunset, this avalanche, and the people of Langtang has a plan and a purpose for what happened, and I marvel at the beauty He has displayed here. I feel privileged for my few weeks here and for the chance to be a part of what He is doing for the people of this valley.